Make this spring’s fundraiser exciting by taking advantage of the warmer weather with these sunny-day ideas. After a long and dreary winter with snow that made an appearance even into the early days of spring, you are more than likely ready to get outside and stretch those legs. Make this spring’s fundraiser exciting by taking advantage of the warmer weather. These warm-weather fundraising ideas are sure to win the approval of your kids as well as all of your potential donors. 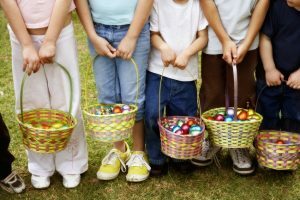 With Easter coming soon, an Easter egg hunt fundraiser would be the perfect opportunity to involve young children and their families. Everyone can enjoy the search for the golden egg, collecting candy and coins along the way. This year, Earth Day falls on Sunday, April 22nd, so it would be easy to organize an Earth Day Hike over the weekend or the week prior. This fundraising idea is perfect for older elementary school students as well as middle school and high school students. Chaperones will be needed, but any adult willing to come on the hike will likely be a willing participant in the fundraising efforts as well. Organizing a flower delivery service for your fundraising efforts is the freshest, sweetest-smelling option out there. Buy a variety of springtime flowers and arrange them into beautiful bouquets that you and your children can deliver right to your donors’ homes. It’s warm out, which means it’s time to tie up those running shoes. 5Ks and other small fun runs and walks are great ways to draw people’s attention to your fundraiser. Map out an area in your neighborhood or around your child’s school where most people are familiar with the route. Make sure it’s a sunny day, as you will surely have a better turn out when the weather cooperates. If you are looking for a way to help your children and the organizations they are involved in developing fundraising strategies, hosting a fundraiser with Claire’s Gourmet is a great way to do so. We are happy to help you every step of the way, from choosing the delicious products to sell to planning the fundraiser, to keeping track of your progress online, we have you covered. We have been working in schools and organizations since 1969 to offer high-quality products like gourmet desserts, pizza, popcorn, and sweet treats that sell themselves and help you meet your fundraising goals. For more information on our fundraising programs, visit us online or give us a call at 800-359-1919. For more fun fundraising tips, follow us on Facebook,Twitter,Google+, and Pinterest. This entry was posted on Friday, March 30th, 2018 at 2:52 pm. Both comments and pings are currently closed.